In Part 1 we listed some of the effects of circuits in space and noted that they were all power-consuming effects. We asked: Where is the power source? The power could be generated locally. The rotational inertia of a body could drive the circuit in much the same way as a water-driven turbine in a dam drives a generator. Early plasma physicists often simply assumed such a mechanism. 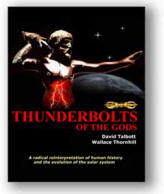 But because smaller-scale circuits in space are invariably coupled to larger-scale circuits (such as the coupling between the auroral circuit and the "solar wind" circuit), the Electric Universe posits a remote power supply. An electrical current in plasma will generate its own magnetic field and "self constrict" the current channel. This is called the Bennett pinch effect. It produces filaments or threads of current that remain coherent over large distances. Multiple filaments tend to spiral around each other, forming helical "power cables" that can transmit electric power over large distances. These cables have been identified running from equator to poles in the circuits that power the aurora. 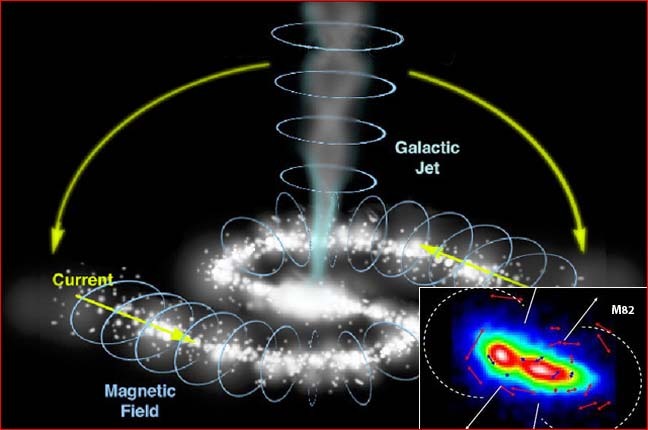 Plasma cosmologists also identify them in the filaments that extend from active "radio" galaxies to the "radio lobes" (double layers) far above each pole of such galaxies. Almost every body in the universe displays some kind of filamentation. Venus has a tail composed of invisible "stringy things" (NASA's description). Comets have tails composed of visible "stringy things"--the ion tails. The neon-light-like glows of planetary nebulas resolve, in close-up views, into intricate webs of strings. The jets of Herbig-Haro stars and active galaxies are often resolved into braided filaments. And the spiral arms of some galaxies look "hairy" with threads of material extending from them. If all these filaments are Birkeland currents, they are only the visible portions of entire circuits. The rest of the circuit may generate magnetic fields that can be mapped, and the map will give an indication of the extent of the circuit. The smaller image above is such a map of the galaxy M82. The arrows indicate the direction and strength of the magnetic field. The larger image is an artist's conception of a likely circuit schema that flows around and organizes the galaxy. High-density currents flow out along the spin axis to large distances. These distant regions are likely locations for energetic double layers (which show up as radio and x-ray lobes in certain active galaxies). The currents then spread out and flow circumferentially around to the equatorial plane. They return to the galactic core along the spiral arms, pulling in matter and pinching it into stars as they go. Every element in these galactic circuits radiates energy. So the circuits must be powered through their coupling with a larger circuit. The extent of that larger circuit is indicated by the observation that galaxies occur in strings. This is why Arp's observations of connections between high-redshift objects (supposedly far away) and low-redshift galaxies (relatively nearby) are important to plasma cosmologists: If the far-away objects are really companions of nearby galaxies, everything we see outside the Milky Way is part of the "stringy" structure of the galaxies. The strings of galaxy-quasar groups are actually super-galactic Birkeland cables along which the groups are "pinched" out. Arp's observations raise the possibility that everything we see occurs along one braided filament that swirls from the Virgo supercluster to the Fornax supercluster, with our galaxy situated midway. This "string of galactic superclusters" would then be a load in a circuit whose extent--and whose power supply--is far beyond all we presently see and know.